The pictures this week aren`t the greatest so bare with me while I explain. This week`s challenge is to use a length of ribbon to meander along a seam. Usually I use beads to attach the ribbon but whatever you want to experiment with is great. In the first picture (above) is a good example of what I mean when I say the ribbon is meandering. It isn`t just going in a straight line - rather it wanders a bit and can loop around or fold - all of which gives it some nice textural interest. Before anyone gets excited about how wonderfully I beaded down this ribbon,,,, nope, it came with the beads already on it. It would be a better example if it was actually on a seam but we`ll have to use our imagination a bit here. On this second example, again unfortunately not actually on a seam, the ribbon is sewn down under the roses. The ribbon is just sewn on straight here and I don`t like it as much as the first one which has more interest I think. So, likely everyone has seen the technique I am talking about here - bows and ribbons often appear on crazy quilting blocks attached with seed beads. These two show the lovely meandering I have been trying to describe! For something completely different, here is a ribbon held in place with stitches instead of beads. If anyone has a better picture they would be willing to share I would love to add it here! This was all I could find in my laptop here at the lake. For anyone happening on this post who isn`t familiar with the BAS, the Build a Seam Challenge is open to anyone who would like to take part. My only request is that you share a picture of what you come up with. Please leave a comment with a link to your photo so we can all enjoy your creation. The purpose of the challenge is to try to stretch our comfort zones a bit as far as seam treatments go by trying new stitches, etc. 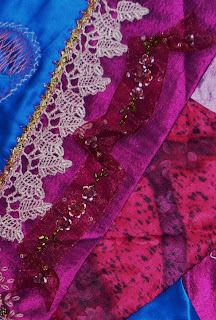 Each week I will post a new stitch technique or a basic framework for a seam and it is up to everyone to see what they can add in the way of stitches, beads, baubles, etc. to come up with a seam treatment they are happy with. Have fun! Here he is - the Great American Pelican. I have given up on getting a better picture than this - just can`t get close enough! I would still like to get a photo of one in the air though - there they are so majestic with their huge wingspan. I look forward to seeing the pelicans every year when I come back to the lake. They really are such gorgeous birds! Well, I finally had to go to the post office and say good bye to Simona's block today. It is such a lovely block I could have happily kept it until it was full! But since I am only the second to stitch on it I don't think that would be appreciated. So, the photo above is of what I have added to the block. This is only the left side of the block so the stitching that was already done is not visible here. The first thing I added was the little garden scene which I have posted about before and the double herringbone seam above it with the little cream coloured glass beads. Next I worked on my BAS Week 29 seam. I think I need to get over my obsession with Gloriana Princess Petite Perle though - it is getting me in trouble! There was enough in a skein for the bullion roses you see on that seam and only that many, which explains my next little motif which covers the rose-less bottom end of the seam! God bless lace - it covers a multitude of sins! The cabochon is an old earring from the thrift store, half the clip assembly is still on the back so it didn't want to lay down nicely but I think I figured out a way to bead it on that actually worked! I may write a tutorial on it just so I remember how I did it next time I have one to do. Simona's whole block had a rose theme to it so I followed suit. My last motif was this basket of roses silkie from my stash The background of the silkie was white-white and glared against all the soft creams of the block so I trimmed it down and buttonholed all around to attach it. I think it worked out okay. I hope Simona will like what I have done - I am feeling a bit bereft now the block has gone on it`s way - I am blockless and feel at loose ends. Of course I can think of about five other projects that should have been finished yesterday so maybe I should get on them! Well, here is my sample seam for last week's BAS (Build a Seam) Challenge which was the Knotted Herringbone stitch. Basically all I did was to add bullion roses in the spaces of the herringbone - not very imaginative but I love these roses so that's okay! Awhile back I posted pictures of the puzzle pieces I made for the swap Pat Winter organized, Pieces of Friendship. I received three of my pieces in the mail this week, the fourth is coming from Pat personally and will be a bit later. This first one (above) is by Arlene White of the UK. Arlene and I are both members of CQI and when she received one of my UTS pieces we wondered if I would in turn receive one of hers. I am happy to say I did. To fully appreciate these tiny crazy quilted works of art you have to keep in mind that each puzzle piece is only four inches square. I think my favourite part of Arlene's piece is the spider - isn't it gorgeous? This second piece of my puzzle is the work of Amber Rutz. The center features a beautifully embroidered and beaded heart. Lovely! And here is the last of the three - another crazy quilted one from Orinda Spence.. It is done in pastels and heavily embellished. Again, I'd like to point out the total size of only four inches so you can appreciate all the tiny work on this one! This has been a great swap thanks to Pat Winter being such a wonderful hostess - and there will be another to follow! If you are interested in taking part in the next one - and to see all the eye candy of the pieces in this one - check out the Pieces of Friendship blog. No, I have not decided to bless you with pictures of one of the outhouses that I clean each day as part of my daily regime here at the campground! At least not directly. What I want you to notice is the swallow sitting anxiously in the tree waiting for me to pack up my cleaning gear and vacate the premises. This particular outhouse is for some strange reason designed with a large gap at the top of the doors. The blur in the top left hand corner of the door is Ms. Swallow again or perhaps it is her mate. They both seem equally unhappy about my presence in the area. Here is the reason the two swallows are so concerned. Each year they build their nest and raise their young inside the outhouse close to the ceiling. For the most part, no one notices the nest up there and they go undisturbed. No young here yet, peeking their heads up for a snack, but it shouldn't be long. These swallows are another of my favourite birds here at the lake and, like me, they come back each year faithfully. I took part in a Potholder Swap on the Mailblocks group. My idea was that I would accumulate some lovely potholders in this ongoing swap to gift my daughter with when she moves into her own place this year. I am not sure if I can part with this one though! I received this beauty from Debbie in Georgia and it is a project someone had started that she picked up at an estate sale. Debbie believes the fabrics are from feedsacks. Whether they are or not, they are certainly charming vintage fabrics! Thank you, Debbie! I made a potholder for Debbie in return from this crazy quilt block I had been gifted with. It was difficult to stay away from beads, buttons and charms but I did not think they would be appropriate for an actual working potholder. I had just finished this one when I realized it did not meet all the requirements of the swap - 100% cottons were specified. So, I decided to send this one anyway and make another to go with it that did meet all the specifications. I have been following the Selvage Blog with fascination for some time now and decided this was my chance to play around a bit with selvages. So, here is my selvage potholder for Debbie! It was fun to do and I am even more admiring now of the folks who are making large projects like whole quilts with selvages. All I can think is that they have much larger fabric stashes than I do since this little potholder took most of the selvages I could glean from my stashed fabrics, at least here in the trailer. So, this is where I started - with two thrift store finds. The first is a package of soap roses - I love these as they always strike me as so ladylike. The second item is a round glass box with a little verse about a new baby boy. The verse got taken out and I was able to slip a silkie from the crazy quilting stash into it's place. Then the roses went into the box and voila! I ended up with a nice little accent for my Secret Sister's washroom! After wrapping it in a couple of fat quarters in the colours she needs it is on it's way! I have a few picures to share that I have been taking around the campground the last day or two. These first three are of the little cacti I found blooming happily amidst all the dry grass. Isn't the colour of these blossoms wonderful? I came across them when I was mowing - I have to keep a close eye on the ground to avoid rocks and small hazards for the sake of my mower blades. Good thing - or I would have missed these little beauties. The first two pictures were taken from above so the entire blossom showed in all its glorious colour but this one is from the side and you can see them sprouting out from the top of the cacti. It is easy to not notice them so they are always kind of a special treat when you find them. This little guy is, as far as I know, a type of ground squirrel - what we commonly call "gophers" here. Usually though they are a solid colour so my husband and I were quite taken with this little fellow and his unusual markings. We have christened him "Southwest" because my husband says his markings remind him of the southwest style. He is cute, isn't he? The stitch for this week is the Knotted Herringbone Stitch. I am always happy to find another variation of herringbone stitch since it is one of my favourites. I have included a tutorial on how to do the stitch in the previous post. I hope you will have fun with it! I want to take a moment to thank the faithful few who are following these posts and doing the Build a Seam challenge with me. It is always fun to see what everyone comes up with - the variations are always imaginative and beautiful! It would not be much fun to do this alone so thank you all for playing with me on this! I love herringbone stitch so I am always on the lookout for a new way to use it. When I came across this variation yesterday I thought I would share it with you. First of all, start by working a row of regular herringbone stitch. For this I used Gloriana Princess Petite Perle silk in a colour called Raspberry Parfait. Next, you go back over the herringbone working the knots in a different thread, stitching from right to left. In this case I used a thicker metallic thread I received from Hideko in Japan. It is used for making temari balls and was just perfect for this. Since you are going to be sliding your needle under the "X's"and not piercing the herringbone threads, it is helpful to use a blunt tapestry needle for this step. Start at the top "X" on the right side by bringing your needle underneath the "X". Below the "X" you place your working thread over the end of your needle from right to left and then bring it back around under the needle from left to right. Tighten up the knot, leaving enough slack in the first leg of the metallic thread that it is loose enough not to just cover up the original leg of the herringbone. You want it to accent the herringbone, not obliterate it. Now you move to the next "X" on the bottom and repeat the process. Bring your needle under the "X" and bring your working thread over the end of needle from right to left and back under the needle from left to right. Tighten up the knot a bit, leaving a bit of slack in the thread between knots. Carry on repeating these two steps, moving from right to left and alternating top and bottom "X's". Here is a sample of the finished row of stitching. As you can see, there has been a little judicial editing done to my sign! I did not even do it - the guilty parties are my friends, Heather and Bill, who are visiting the campground this week. Heather and I go waaaaay back - all the way to schooldays! You know, back when dinosaurs roamed the earth! lol I haven't seen her for ages - must be years now - so it was wonderful to see her again. As you may have gathered, this handsome devil is Bill, the man who makes my friend happy! Conveniently enough he is also her husband! Nice when things work out like that, eh? I laughed so hard when I saw the sign. Can't wait for dh to see it too! lol - who's got top billing now, eh? Here's a heads up for you that Wendy of Stitch Duchess' Crazy & Sane Quilting World is having a giveaway for her blog anniversary. To check it out go to her blog. I am working on another Spider & Webs themed block. I needed somewhere to hang my spider web so did this little garden scene. You can hardly see the web but it is on the watering can done with blending filiment. The whole thing looks a little wonky but you are seeing it larger than life. The whole scene is only about an inch high and maybe two inches wide. It was fun to do and was inspired by A - Z of Bullions. I have some more to do on this block but thought I would share the start anyway. Stitching time seems to be at a premium these days so I am happy when I manage to get any done. There is it - my little sign! I keep asking both my husband and my boss why Gary got top billing?? Can't figure it out myself! lol Have you ever seen the series of Fawlty Towers programs? Do you remember how the sign kept changing? Wouldn't be surprised if the same thing happened here! Our little campground no one knows about appears to have been discovered by folks. I am not surprised since it is close to the city and inexpensive. Also we are "first come - first served" so we do not book up weeks in advance like so many other places. It is really nice there are still some places like this where you can decide to go camping after work on a Friday night and know you will still get a spot! The weather was glorious this last weekend and the boaters especially seemed to be having a wonderful time. Please excuse the camera angle - I have managed to make Leslie's wreath look lopsided and it is perfectly round. Anyway, this is the wreath now my bit is done. I was the first to stitch on it and now it is heading off in the mail to Hideko in Japan for her to work on. I spread my stitching over two sections . this is the first at the bottom of the wreath. I've already shown the vase there made from a piece of vintage kimona fabric appliqued down with String of Pearls planted in it. Directly to the left of that I did a gold ribbon garland with snowflake charms hanging from it. Above the garland I did two seam treatments - one a gold feather stitch and the other is cretan stitch with mop (mother of pearl) buttons. I found some wonderful ribbon just before I moved my stash to the lake for the summer. This black and white check velvet ribbon was my favourite and I just had to find a way to work it in. 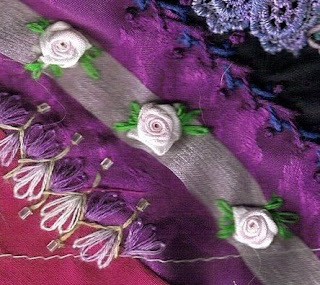 So, I sewed the ribbon down on a patch and then made some gathered flowers and ribbon stitch leaves with silk ribbon embroidery and placed them on the ribbon. To the right of that is my double cretan stitch seam that was last week's BAS challenge. Not much new here. This is the other section I did at the top of the wreath with the trio of beaded ornaments, the satin stitched embossed black fabric and the palesrina stitch seam. There is also another seam I did there with herringbone. I hope Leslie will like what I did and that the other stitchers in this round robin will not find it too hard to work around. Well, here is a picture of a happy man! I am into my third summer of working at the campground at the lake and having my darling husband drive out most weekends to help me for free - at last we were able to get a little boat for him. So, no more all work and no play! He was out first thing this morning checking out all the fishing holes we have not been able to get to before. As you can see from this picture of my daugher, her friend and my husband, everyone approves! I recently received my baggies from the Garden Swap at CQI and this little piece of vintage kimono silk jumped out at me right away, crying to be used. Isn't it gorgeous? Right away I knew I wanted to ues these little vases. I picked out one of the vases, cut it out and attached it with my version of needleturn applique. I thought then I would start building a flower arrangement in it, starting with the growth in the background. I thought some hanging growth would look good on the vase so started by creating "String of Pearls" hanging down on the front of the pot. The stems were done in stem stitch using one strand of DMC and the little round leaves by sewing down Mill Hill Antique beads of a nice gunmetal sort of green. I had planned to add ferns next, then baby's breath, and finally the poinsettias I keep tring to work onto this block. When I had the String of Pearls plant stitched though I decided I liked it so much I didn't want to add any more plants to the vase. Instead I finished it off with a little more growth peeking over the top of the pot and a few fallen leaves at the base. I am happy with it. I can still get a couple more vases from my little piece of fabric - sure wish I could find more of it! When I was posting the picture of the BAS (Palestrina Knot Stitch) for this week, you could see the red flower I did on Leslie's wreath. Here it is again. This is the patch that inspired what I did - the fabric had a lovely embossed pattern on it so I simply filled in the center of the flower with little clear Mill Hill beads and then went over the outer embossed area with satin stitch in Gloriana Princess Petite Perle thread. I scattered a few french knots near the center of the flower and it was done. But it got me thinking about the bigger question - do you frog? (as in rippit rippit) As a matter of day to day stitching, I don't. If the stitches are uneven I will justify it by telling myself if I wanted perfectly even stitches (which, all right, I admit I do), I would use a machine. If the colour is not what I envisioned it would be I will add some more of it somewhere else to try to balance it. Basically, I will do anything to save myself from ripping stuff out. I don't know if I am in the minority in this or not though. So, the question remains - to frog or not to frog - which do you do?